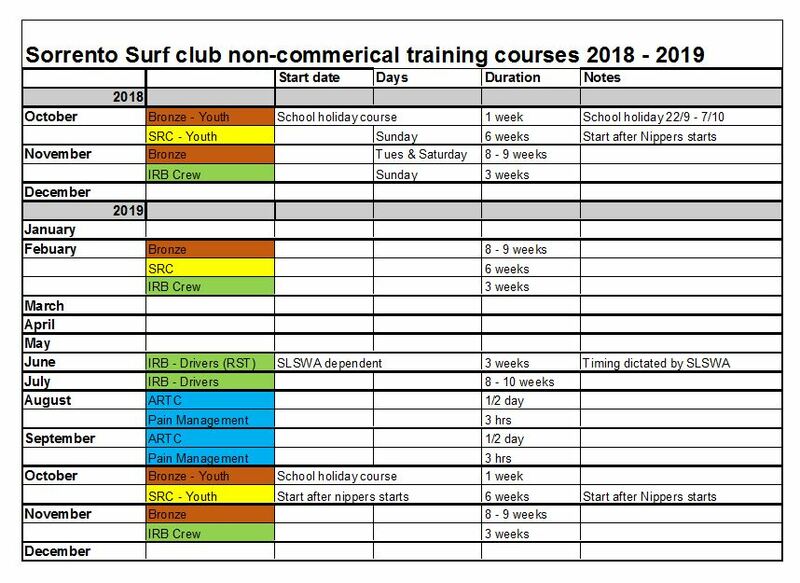 Sorrento Surf Club runs many courses each year. Below is the calendar of courses. These are all the non-commercial courses the club will run. Commercial courses (such as Provide First Aid) are run separately. 3) Email Jess Bunford on admin@sorrentoslsc.org.au to put your name on the list. Please nominate the specific course you wish to do (eg the February Bronze, not just a bronze). 4) Bronze and SRC courses require a course fee. Pay for the course when nominating to secure your spot. Note: There are no waiting lists or general expressions of interest anymore. Your name will be registered for a specific course only. 1 month prior to the course starting we will check candidate numbers and confirm the course. If numbers are insufficient we will advertise the course. If they remain insufficient the course may be cancelled and you would then be offered an alternative date. If that is not suitable and you have paid a fee you will get a full refund.